New from PERSISTENCIA*PRESS . . .
From the chap . . .
words without image is available both in print and online. To request a hard copy, e-mail PERSISTENCIA at persistencia_press@yahoo.com. Coming soon from PERSISTENCIA . . . 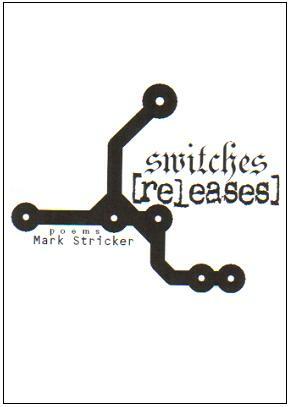 Winner of the 2006 P-STAR Summer Chapbook Contest. I don't know Steven May, but he recently began an excellent chapbook review blog. Those chaps featured so far include Frank by CAConrad, Among the Cynics by Robert Fitterman, and Part of by Hiram Larew (2000 winner of the Baltimore Artscape for Poetry). Check it out -- hopefully some PERSISTENCIA titles will soon be appearing there. Yesterday I was surprised but very pleased to receive Teeny Tiny #8. As its name suggests, TT is a micro-zine both in terms of size (3”x4”, folded not stapled) and content (7 pages with 6 short poems and one little prose piece). Two items in particular caught my eye. The first is a kernel of prose, a nine sentence reflection by Christopher Wells on his “favorite girl.” “She was genuine, not a short summary of . . . a woman,” he remarks. “Overall,” he muses easily, “she wasn’t fussy.” Wells concludes the passage with a somewhat obvious double entendre: “In fact, whatever it was, she would put as much of it in her mouth as possible. It was – exhilarating.” The hyphen really does the job. Clearly, Goldner has a keen eye for the subtle sort of humor woven into everyday life. His style and tone remind me something of a relaxed, modern day William Carlos Williams, or perhaps even a less spacey and more sensible Richard Brautigan. In fact, judging from the voice, those lines may just have easily been inked by EB White. Complete with black and white cut-n-paste images and one sentence film, art, and literary reviews, Teeny Tiny is perhaps the most enjoyable print micro-zine I’ve read in some time. (Black’s Calliope Nerve is another laudable voyage into those shallow waters.) Managed and edited by Amanda Laughtland, it is free with minimal postage costs. Drop Ms. Laughtland an e-mail to request a copy or, better yet, a full subscription. Teeny Tiny will be featured in Dirt #4 along with an interview with Amanda Laughtland. Jesse Crockett (one third friend, one third teacher, one third mystery) comes out of the darkness and into the night with his new e-'zine Listenlight. The first issue is good, the second is better. I particularly enjoyed Amanda Laughtland's quasi-apocalyptic poem series. Be sure to check it out; Jesse has a sharp editing eye and very sensitive, refined tastes. Listenlight, I think, is one of the more promising new publications around, just behind Mark Young's Otoliths. Speaking of which, there are plenty of copies to be bought via Lulu. It's worth the ten bucks American. It would seem that you are in fact the reactionary one, what with your knee-jerk perception of Surrealism as some sort of atheists-only club. It's funny, you see: Kirby's "Christian Marvelous" looks foreward, not back. It's fresh, it's bold. He is rebellious in a new way. He refuses to buy into mindless secularism. Ain't that hip? Plus, it's not like past Surrealists haven't been religious and/or conservative. Even big names: Lamantia died a devout Catholic; Kerouac died a devout Catholic; Dali was an "anarcho-monarchist" and practicing Catholic. Religion and surrealism, it seems, go hand in hand*. You have a dull mind and even duller tastes if WAITING FOR THE RAPTURE turns you off so much. More respected (and coherent) critics applauded the chap, and for good reason . . . it's just some solid stuff. Evidence: four printings, with more to come. P.S. Olson has a bigger -- and better -- collection due out in a few months. I'll be sure to send you a copy. *After thought: This makes sense, I think. What is more otherworldly than the concept of God impregnating a 16 year old virgin with a savior who redeems mankind by being nailed to a tree? If that was't the foundation of Christianity, it'd certainly find a home in the Theater of the Absurd. Water to wine! It's straight out of Genet or Ionesco. Dirt #3 is finally ready to go. The first 100 copies will be printed in full by tomorrow, mailings will be complete by mid-week (at latest). Promise. For all your patience, here's a decent chunk of the Aram Saroyan interview found in #3. Dirt: You mentioned Finlay before. Is it safe to assume that your work was shaped by artists operating outside the realm of poetry? Beyond that, who were your early influences? And this was the Sixties, so it was sort of in the atmosphere. You're young, and the economy is still in a sort of boom phase, and you're discovering who you are, what you like. There was a nice period in there before things got dark in the later Sixties. D: Which of your early poems holds the most resonance for you now? In this one it's another cognitive incident in which for a moment the eye is looking without knowing what it's seeing and then it knows. So it's an infinitesimal time frame in which something happens between the senses and the mind. I think those pieces are interesting sort of neurological transcriptions, a kind of realism that has to do with very small time frames. D: I've heard that 'lighght', perhaps your most (in)famous poem, was the result of a typing error. Can you give that rumor a thumbs up or down? AS: No, that one wasn't a typo (one or two others may have been). The poem adds an extra 'gh' to the word light—a silent addition that adds an element to the word as if to make the phenomenon more palpable, as if the word holds the phenomenon. I could have added another 'gh', so it would have been 'lighghght,' which I think is more than is needed, or I could have done it—as it's sometimes misspelled on the internet —'lightght, ' which doesn’t work at all by my lights (no pun intended). I had an interesting experience a few years ago when I thought I'd do a Christmas card of the word, embossed white on white. What I discovered was that if the word is embossed then the extra 'gh' isn't necessary, because embossing makes for the equivalent palpable effect. PERSISTENCIA is proud to present Plain Speak/Sweet Speak, a dynamic collaboration between G Emil Reutter and Phil Primeau. The double chap of "plain sweet poetry" consists of two parts: the base text and the "remixed" text. This chapbook demonstrates not only the versatility of language, but also the necessity of subtextual examination. It allows reflection on cultural and linguistic patterns and forces the reader to consider the flexibility of the written unit. To the regret of elementary school grammar teachers everywhere, a piece of literature is not a sandwich. It is not a discreet continuum with a beginning, middle, and end. Rather, it is an onion. It is a rug of thickly woven thematic and narrative elements.